BeltEnvy is a collection of oversized pewter pendants, sure to make a statement and elicit compliments. Each features original artwork in a wide range of styles, from elegant to whimsical. 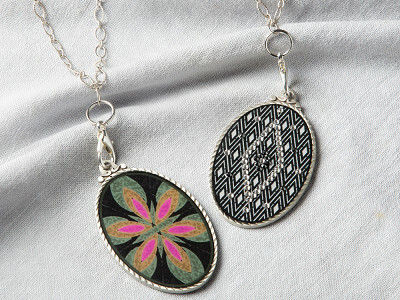 Some are reversible, with a different design on each side. Some are adorned with hand placed Swarovski crystals. They’re all interchangeable with most necklace chains. And they’re all Made in the USA. That last feature is particularly important to Founder Jacqueline Arch, a mother of four who believes our country’s future depends on keeping jobs here. Since 2012, BeltEnvy has been a member of American Made Matters, an organization of 300+ small companies focused on that very objective. For these companies, “Made in the USA” isn’t just an origin statement; it means quality products made from exceptional materials with passion and care. 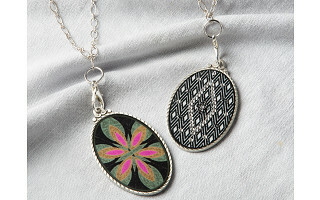 And it shows in BeltEnvy—from the intricate design inside each pendant, to the beautiful, durable pewter frame. A two-step resin treatment protects the artwork with a scratch-resistant, glass-like shine. The result: an eye-catching complement to any outfit, from T-shirt and jeans to dressier looks. Enviable indeed. Hello everyone! I'm proud to bring our handcrafted, American Made accessories to The Grommet. I'd be happy to answer any questions you have! Thank you for manufacturing in America. I hope more will follow. I love your pendants. They really unique. Hi Susan, I think Laura's comment about them being unique is more a point about each being a handcrafted design Jacqueline created. You will be receiving a product that looks like what is pictured above. Hope this helps! I think I made it in under the deadline. @Mike They are all original artwork and I try very hard to keep the embellishing exactly the same. However, at times it is necessary to slightly embellish differently. I would be happy to send you a photo, please let me know how to get it to you. @Jacqueline Mike / Jacqueline - thanks for the clarification. BeltEnvy is a collection of oversized pewter pendants, sure to make a statement and elicit compliments. Each features original artwork in a wide range of styles, from elegant to whimsical. Some are reversible, with a different design on each side. Some are adorned with hand placed Swarovski crystals. They’re all interchangeable with most necklace chains. And they’re all Made in the USA. That last feature is particularly important to Founder Jacqueline Arch, a mother of four who believes our country’s future depends on keeping jobs here. Since 2012, BeltEnvy has been a member of American Made Matters, an organization of 300+ small companies focused on that very objective. For these companies, “Made in the USA” isn’t just an origin statement; it means quality products made from exceptional materials with passion and care.